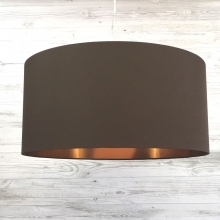 A rich dark chocolate pendant lampshade will create a soft ambience to any interior and will look stunning as a ceiling centrepiece. 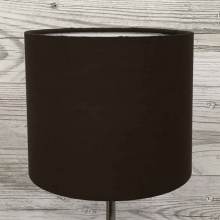 This extra large drum ceiling shade is handmade in chocolate cotton and finished off with a hand rolled edge complimenting the shade. Lined in champagne embossed material this shade will give a warm soft glow once lit.